Add a little sizzle to your dinner for two with our Loaded Tomatoes of Yore®. Roasted to perfection and stuffed with couscous, spinach and double smoked bacon, you’ll fall deeper in love with every bite. Planning a little V-day bash or a romantic rendezvous? Either way, our One Sweet® Bacon Bites will set the mood. 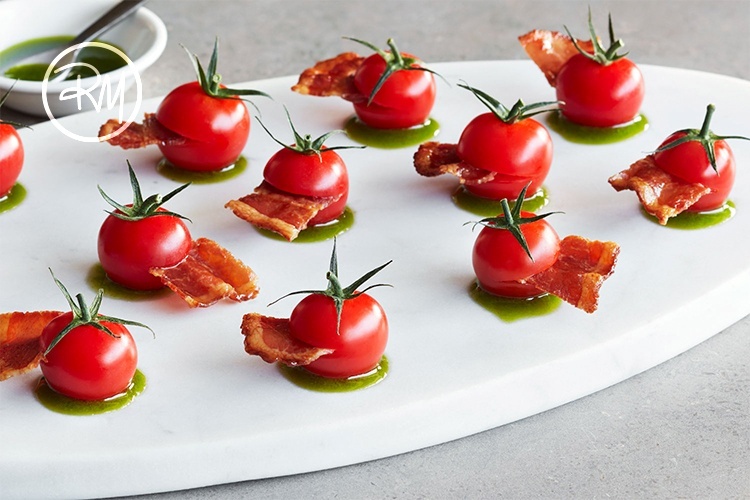 These little bites of bacon heaven are a simple way to add bold flavor to your menu. Looking for a grand gesture that says ‘I love you more than bacon’? May we suggest the SUNSET® Grand BLT Sandwich with Tomatoes on the Vine. We stepped up our BLT game with the addition of red and yellow tomatoes as well as garlic-and-herb cheese to provide a delicious contrast to the salty, crisp bacon and crunchy lettuce. Having a hard time deciding which bacon dish to serve this Valentine’s Day? Then pull out all the stops and make it a bacon trifecta with all three? Because as we like to say here at SUNSET, one dish is good, two is better, and three is BACON!